Director Alex Garcia Lopez helmed two episodes of the absolutely stellar Daredevil season 3—the best Marvel Netflix season there is, actually—and the challenges of each couldn’t have been more different. 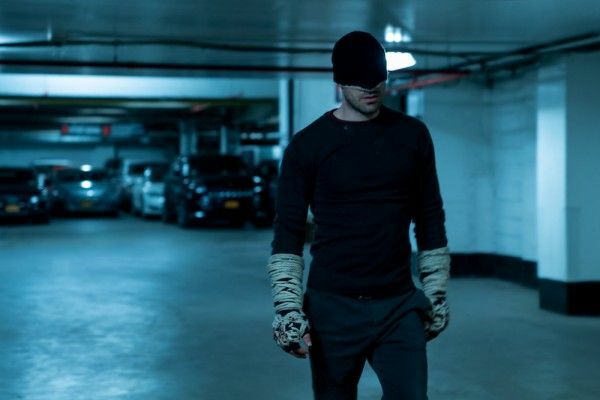 His first, episode four (“Blindsided”), contains the biggest action set-piece in the small-screen MCU’s history, an 11-minute one-take brawl inside a prison that sees a drugged Matt Murdock (Charlie Cox) fending off waves of convicts and prison guards while also enlisting the help of an Albanian gang, When the director return to the series for episode ten, “Karen”, showrunner Erik Oleson tasked him with bringing things way, way down, for a moody, introspective flashback to Karen Page’s (Deborah Ann Woll) violent small-town past. In this one-on-one phone interview, Lopez spoke to Collider about designing that massive, 50-stuntperson prison fight, the most frustrating false starts, the euphoria of finally getting it right, the tone he wanted from Daredevil‘s first flashback episode, and much more. COLLIDER: When you first find out that the plan is to do this massive, one-take fight scene, what’s the first step to making that a reality? ALEX GARCIA LOPEZ: It was a few steps, because it wasn’t written that way. Lewaa Nasserdeen was the writer and wrote it like this huge 12-page scene. Once I read it I fell in love with the idea of doing it as a one-er, to feel the anxiety and desperation and the slightly almost suicidal journey that Matt is in. I pitched it to the powers that be, and once everybody really liked the idea, there was still, like, is it possible? The first thing we did was to go to the jail—it was like the day before Christmas, actually, or two days before Christmas—and me and [Gary Ray Stearns], our stunt coordinator and his team, and Christopher LaVasseur the cinematographer, the three of us we went out there, the whole morning, just walking through the whole space. Trying to come up with some sort of plan, an idea of the journey, having in mind that there would be some Texas switches involved for Charlie and [stunt double Chris Brewster], and also for the camera and sound man. So the first big thing for the three main components—stunt coordinator and the camera department, who in many ways acted like stuntmen themselves—for them to see if it was logistically doable. We walked away after that three, four hours brainstorm session feeling really confident. And then it’s that thing of like when you got a great team around you and you throw an idea out there, and then it’s just fantastic when everyone ups their game and gets excited and they start throwing back better ideas. Trying to increase it and make it better. That’s what happened. Gary and his team were so inspired by the huge challenge to do this one-er with I think it was like 50 stuntmen. He went away and they started rehearsing, he would show me the clips, the videos of them starting to practice it. First, it was Brewster alone, then the moment when everyone got super excited was when they did the whole thing. Without Charlie, but they did the whole journey, filming on like an iPhone. Purely just on a stunt technical way. And they felt very confident that they were going to be able to do it. It’s obviously this massive, impressive thing on a purely technical level, but what thing specifically were you thinking about to make sure it was also character-driven? LOPEZ: Totally. And that was something that, from day one when I spoke to Erik, he told me that—this was before they even started filming episode one—his whole idea for the season was to step away from what season 2 did in the sort of grand fighting scale and bring it to a much more grounded and more visceral and subjective level. With Matt, or Fisk, or Foggy, whoever was leading that particular episode, to be wiith them as they struggled or had to choose high stakes. When I read my episode…clearly Matt is going through this slightly self-destructive journey, mea culpa style, where he separates himself from his friends, he’s trying to reinvent himself, he’s almost on a suicidal journey. And he’s making bad choices. He gets to the prison and he’s not fully fit, he’s still hurting physically and mentally, and gets to the prison and thinks this is a great idea. Obviously, it comes back to bite him. So, to be in that moment with him where he’s drugged, but also physically not what he used to be, when he’s desperate to get this information from the Albanians, everything he’s trying to do is not well-thought out, really. His desperation and anxiety to get Fisk, it all felt like we do scenes as a one-er, all that anxiety, all that claustrophobia, it comes automatically because there’s no cuts. I think the audience automatically starts to feel on the edge of your seat. You’re going, “Oh my God, what’s happening?” You keep pushing that. When I pitched the idea to Erik, he was like, “Right, when we get to the moment with the Albanians, that’s when we cut right?” I was like, “No, no, no, that’s where you keep going, man.” That was a four-page scene, and in that moment Charlie—and Matt but definitely Charlie—he’s going to be exhausted. 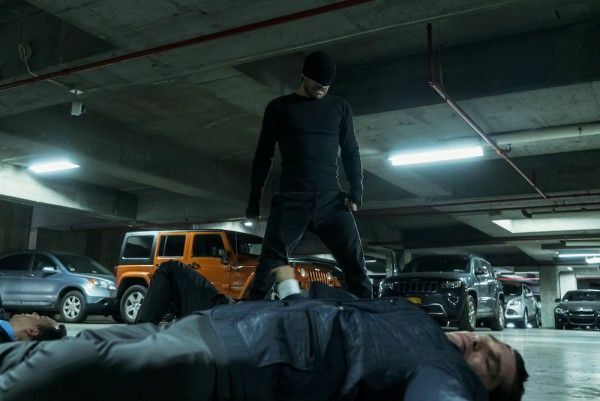 The drug is kicking in, he has to defend himself before the Albanians stab him, he has to convince the Albanians to team up with him because Fisk is the common enemy. He’s going to be out of breath, he’s going to be exhausted, spilling blood. If we continue that as a one-er we’re really going to feel it, we’re going to be holding our breath as well. That’s why the one-er, yes, on a technical and entertaining level was going to be there, but I felt it was all coinciding with what Matt felt.